Increased connectivity creates the conditions for unprecedented business growth. It also opens up your systems to countless threats. Hackers, botnets, viruses, and ransomware lurk around every corner—and when your vital business assets are on the line, these risks have the capability to severely impact your organization. I’m not sure I’m doing enough to protect my IT systems from cyberattacks. Protecting your IT environment from cyber threats is an absolute necessity. Unfortunately, in today’s information security services landscape, many providers will overwhelm you with hardware and software tools instead of providing the expertise and long-term commitment it takes to make those tools effective. I’ve heard from a thousand vendors trying to sell me security tools, but I don’t know how it all fits together. Partnering with an experienced information security services provider is the best single action you can take to reduce your cyber risk. A trusted partner can help you build a security program from the ground up, or act as a force multiplier for your existing operations. Don’t go it alone. Choose a security partner that has what it takes to help you stand up to the ever-evolving threat landscape. I want a partner that can make me feel confident that my systems and data are truly secure. 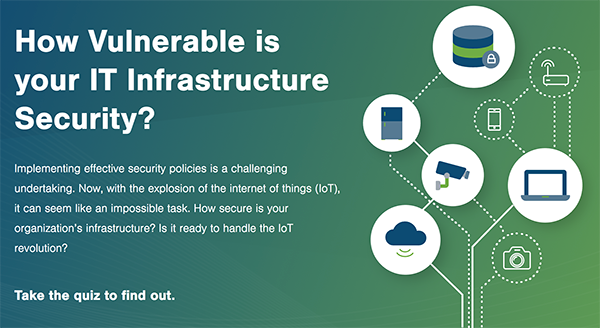 How Vulnerable is your IT Infrastructure Security? Implementing effective security policies is a challenging undertaking. Now, with the explosion of the internet of things (IoT), it can seem like an impossible task. How secure is your organization’s infrastructure? Is it ready to handle the IoT revolution? At ShoreGroup, we understand IT security is about more than just having the right tools. We are a next-generation managed security services provider (MSSP), providing access control, asset visibility, user behavior analytics, data classification, and managed detection and response services to clients of all sizes. At ShoreGroup, we help you maximize your security by tailoring a strategy to the specific vulnerabilities of your IT environment, consolidating and optimizing your security tools, and managing your program into the future. Our holistic approach to IT security will help you operate with more confidence, knowing that your sensitive systems and data are as safe as possible from the threat of cyberattacks. Discover whether your critical systems are exposed to cyber threats. Choose the best hardware and software for your information security needs. Leverage intelligence and automation to detect and respond to malicious behavior.